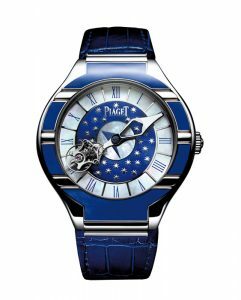 The Manufacture de Haute Horlogerie Piaget and the City of the Doges have established close ties. As a patron and an active player in the renovation of the Torre dell’Orologio overlooking St. Mark’s Square in Venice, Piaget has contributed through its traditional know-how to restoring this monument to its former glory. Inaugurated last year after 10 years of meticulous restoration work, the tower and its clock are once again on view for the millions of visitors who come yearly to admire this remarkable symbol of the city’s architectural history. To commemorate this restoration, the Manufacture de Haute Horlogerie Piaget is presenting a one-of-a-kind edition of its Polo Tourbillon Relatif watch. Through this exceptional creation, the watchmaker once again expresses its consistent determination to place technique in the service of aesthetics. Offering a stunning vision and reflecting the magic of perfect equilibrium, this unique model assembled by a single watchmaker marks off the time to the rhythm of the Manufacture-made Calibre 608P, a mechanical hand-wound flying tourbillon movement. Suspended from the tip of the minute hand, the flying tourbillon carriage appears to be visually disconnected from the base mechanism driving it, naturally concealed beneath the dial. The hours are read off by means of a central disc, while the minute hand takes the carriage spinning with it in its hourly rotation around the dial. In an eloquent demonstration of virtuosity and extreme complexity, this mechanism has been adorned in a manner worthy of its noble stature. The white case crafted in white gold – including the bezel, the back and the sides – as well as the dial are decorated with grand feu enamelling. This procedure requires a specific and high level of know-how. 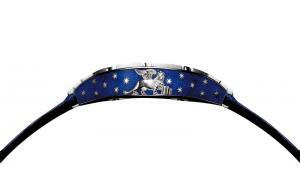 Using the champlevé technique, the enamel specialist hand engraves the white gold elements, leaving out only the motifs – the lion, stars, “Pièce unique” signature – that will appear in white gold at the end of the process. The engraved hollows thus become receptacles for the enamel, composed of crushed pigments applied in successive layers with a fine brush and repeatedly fired in an oven heated to over 800°C. Each step entails a risk of seeing the work wiped out by a flaw in the material or a mistake in execution. Once completed, the delicate operations continue with a fine engraving of the white gold motifs – such as the lion – that could not have withstood the firing processes. Hence the necessity of working on a piece that is already enamelled, which implies a further risk of damaging the precious object. 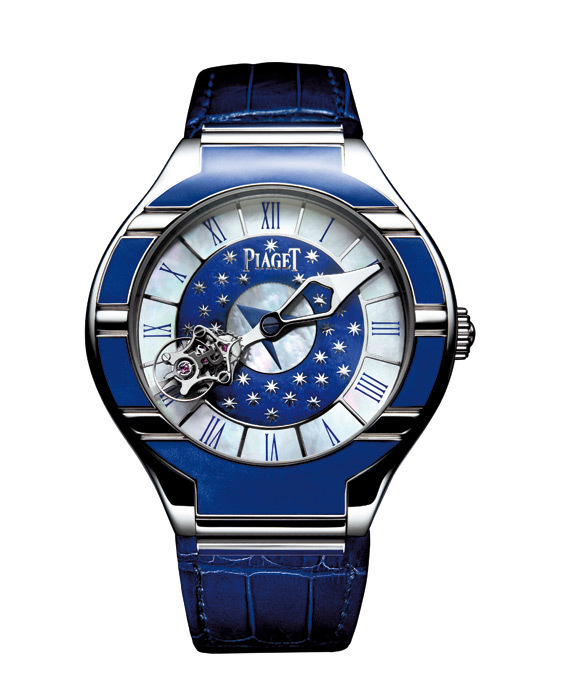 Drawing inspiration from the colour blue and the motifs on the Torre dell’Orologio, the case of this one-of-a-kind creation reveals Piaget’s historical know-how in the art of enamelling. Like the Venetian tower itself, the white gold stars sparkle against a blue sky,the crown is adorned with a stylised sun. On the side of the case, the famous winged lion of St. Mark, the symbol of the city, is engraved in white gold. This model is a one-of-a-kind creation and an authentic collector’s delight.